Driving from Cape Town along the N2 one travels over Sir Lowry' Pass, past Grabouw and Botriver eventually arriving in the Overberg. It's about an hours drive from Cape Town. On both sides of the road as you travel towards Caledon you will see cultivated fields where different grains are being grown. This is one of the homes of South Africa's National Bird. South Africa's Blue cranes are on the endangered list and farmers and conservationists are working together to ensure that this beautiful bird does not die out. It is strange that an endangered bird has become a tourist attraction in a farming area where before it was killed as it was considered a threat to crops. Up to about 10 years ago the bird was very common but now it is on the Red Data endangered list. It is extremely sensitive to disturbances but in the Caledon area it does not mind the farming activities that take place near it as long as it is left undisturbed. For some reason these birds mainly occur in South Africa with a small population in Namibia. The farmers of the Caledon region saw the potential of increasing tourism to their region and so as a community they embraced the project of protecting the birds in their area. To do so they have established the Caledon Blue Crane route where visitors can see the blue crane in its natural environment. There are 12000 birds in the Western Cape with the main flock being in the Caledon area.There are a few smaller groups of birds to be found in the Swartland (Malmesbury wheatlands) Bredasdorp and Swellendam. Of course the change of attitude did not come overnight and farmers had to be given a good reason to stop the killing. This reason was the spinoffs of tourism to the area whic they call "Agritourism." The Blue Crane have a few peculiarities of their own. They have an elaborate mating dance and normally take a partner for life. 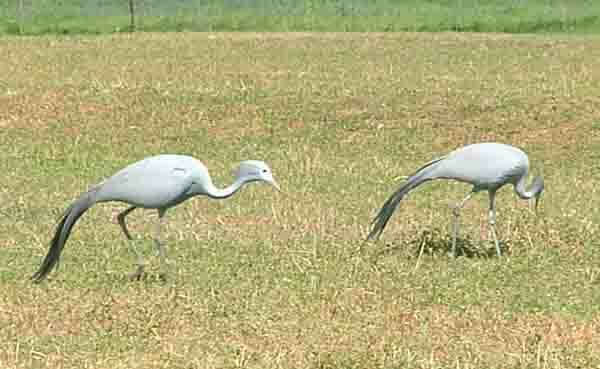 Cranes only breed once a year and produce two chicks at a time. For the farmers of the Overberg this is not the first time that they have rescued a species from extinction. Back in 1931 the Bontebok antelope was close to extinction and then the Bredasdorp farmers provided a reserve where they could be protected. During the 1960's this park was moved to an area on the Breede River near Swellendam where the Bontebok National Park was established. Its actually quite amazing what people can do when they have a reason to do it. Next time you visit Cape Town take a drive out to Caledon, enjoy the fantastic scenery of the Garden route on the way and see the Blue Cranes in their natural habitat.